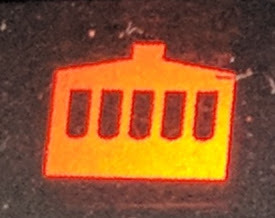 Since the day I bought the van the coolant warning light has shown from time to time. Usually it would come on when I started driving and eventually go out. The previous owner had mentioned it and said not to worry about it. Being a little concerned I topped up the coolant expansion tank but it quickly overflowed the first time I parked. I asked the service folks to check it out, they reported no leaks in the radiator and suggested that the coolant level sensor might be faulty. This week, I parked after a reasonable drive and noticed a stream of green coolant running down the road. The expansion tank was definitely empty. Back to Jason at the service centre. It turned out that the radiator cap, which has some sort of pressure release mechanism, was faulty and this explains the behaviour. Kindly they only charged me $12 for a replacement cap. No more warning light - I won't miss it.